Border Police officers foiled a stabbing attack in the eastern Jerusalem neighborhood of Issawiya on Wednesday evening. The incident occurred as dozens of Arab youths were throwing rocks at Border Police officers who were patrolling the neighborhood. 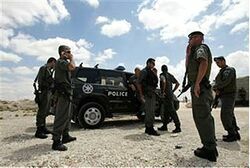 The officers began arresting the Arabs, when one of them, a female, tried stabbing one of the officers. She was immediately stopped. The officer was not hurt. Earlier Wednesday, a Palestinian Arab man attempted to run over IDF soldiers near Homesh in northern Samaria, before fleeing the scene of the crime. That attempt was the second in 24 hours targeting IDF soldiers. Earlier in the day, 19 year-old Mohammad Mubarak opened fire on an IDF guard post next to the Samaria community of Ateret, which lies roughly midway between Jerusalem and Shechem. Soldiers returned fire, killing the terrorist. Both attacks came just 24 hours after the Israeli Security Agency (Shin Bet) released statistics noting that terror attacks have been on the rise in Judea and Samaria. The attacks have been linked directly to the peace talks between Israel and the Palestinian Authority (PA), alongside the PA’s ongoing incitement campaign against Israel.